Petrarca (Petrarch) was born in Arezzo in the year 1304, in a time when the world was breaking out of the Dark Ages and bursting into the Renaissance. Of noble birth, Petrarca devoted most of his early years to studies in Montpellier, and then proceeded to study law in Bologna for two more years. He found himself drawn to Latin literature and writing, and he eventually became friends with another historical Italian writer, Giovanni Boccaccio. Petrarca composed many sonnets during his stay in Avignon and even in his young age, he began to acquire the reputation of an admired writer. Petrarca strived to better his understanding of Latin literature, Traveling through much of Europe to obtain ancient Latin works. In 1326 when his father died, Petrarca decided to return to Avignon. He entered into the service of various clerical offices under Cardinal Colonna. During his service, he still found time in his active life to compose numerous lyrics and sonnets. However, Petrarca had yet to meet the woman who would become his ultimate inspiration for some of the most famous romantic lyrics of the time. It was April 6, 1327 and Petrarca most likely expected it to be no different from an ordinary day. He was at the church of Sainte-Claire d'Avignon, when suddenly his eyes rested upon the most beautiful woman he'd ever seen. At the time, Laura was nineteen years old and the wife of Hugues de Sade. She was blonde and lovely in appearance, and seemed to Petrarca to be dignified and stately. At that moment, Petrarca felt the provocation of the deepest emotions in his heart, and it was only natural that he convey these emotions in his writing. From this well of passion, Petrarca wrote of boundless and indescribable love for which there was no cure. His love went unreciprocated, but it did not stop him from becoming completely enthralled just by being in Laura's presence. Though he agonized over the thought of his unreturned love, it was still a feeling he celebrated in many sonnets. 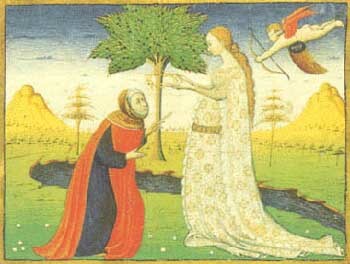 In Canzoniere, Petrarca chronicled his first encounter with Laura and the unspeakable desires it provoked. His portrayal of Laura in his writing defied the typical image of women in writing and surpassed it to paint women as spiritual creatures of immense depth and ability. Petrarca found writing in Latin most satisfying, and he considered the works he composed in Latin to be his best. One of Petrarca's most famous Latin works was Africa, an epic that shed light on the practices of the Roman republic. Some of his other works in Latin include the Letters, On Contempt for the Worldly Life, and On Solitude. Although Petrarca favored his Latin works, critics offer equally high praise for all of his work. As years passed, Petrarca's compositions gained more fame among the people, and in 1341, he was crowned as a poet laureate in Rome. With this title came charges for diplomatic duties on Petrarca's part, and as he traveled through northern Italy, he realized that his fame was becoming more universal. His writing had earned him international celebrity. Just as his popularity was rising, however, Petrarca suffered a devastating emotional blow. In Petrarca's time, the Bubonic Plague was still running rampant throughout Europe, and nearly everyone of the time had suffered a loss associated with the disease. Unfortunately, Petrarca would become one of those sufferers. In 1348, his precious Laura was struck with the plague and died shortly afterwards. The grief caused by Laura's death inspired as many sonnets and poems as did his love for her when she was living. To ease his pain, Petrarca continued to travel throughout the land, and finally settled down around 1367 in Padua. He spent his remaining years in various religious services. 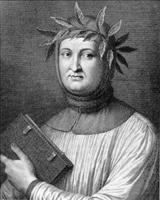 Petrarca died on July 18, 1374 in Arqua in the Euganean Hills. He left behind a small sum of money to his friend Boccaccio, as well as numerous works of literature that would gain even more fame after his death. Petrarca's devotion to achieving new heights in the work of literature would earn him a name for centuries. His literary works would leave a strong impact on literature in Western Europe, and would influence the path that literature would take in the years after his death. 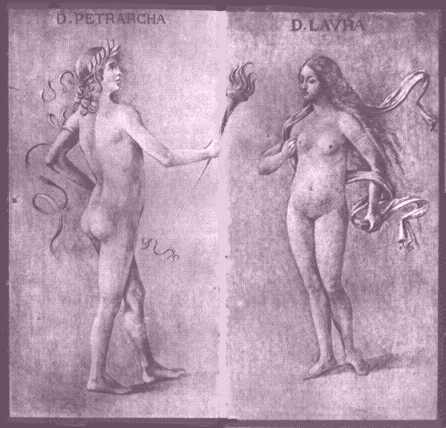 Many remember Petrarca for his accomplishments as a humanist and eloquent correspondent, but most will forever remember his deep and unequaled love for Laura. 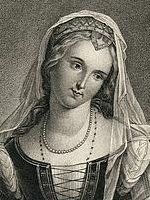 There are many critics who suggest that perhaps Laura was merely a fictional character of Petrarca's fantasies. No matter what Laura's true existence was, there is no doubt that she inspired some of the greatest love lyrics of all time and that she aided Petrarca in becoming one of the most inspirational Italian writers in all of history. You can download Petrarch - 53 poems from the Cazoniere translated by A.S. Kline from Tony Kline's website.